We chat to an RSPCA Inspector! Recently we’ve come across a series of books based on real-life animal rescues by the RSPCA! Plus for every copy sold, 15p will be donated to the RSPCA. 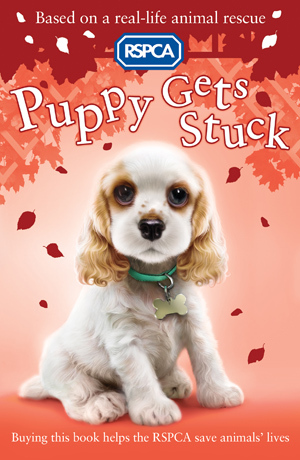 In one of the books, Puppy Gets Stuck, a little puppy called Pickle falls down a mineshaft and needs to be rescued by the RSPCA. The story is based on a dog called Bean who did actually fall down a mineshaft – and we’ve got hold of Gary Eastwood who was part of the RSPCA rescue team that saved him! Tell us about the rescue you were a part of. Bean’s owners had been on a camping trip when Bean disappeared. They contacted the RSPCA, and I was the Inspector on call. I was worried about how we were going to pull Bean out of the mineshaft safely, and I came up with the idea of lowering a long crate into the shaft using two ropes. I realized that if we encouraged Bean into the crate, then tilted it and pulled it up using one rope, the dog would be unable to jump out and hurt himself more. We tried lots of things to get Bean into the basket – old socks and dog food – but it was only when we put in his blanket and told Bean to “get in his basket” that Bean actually did – just like Pickle! What was the trickiest part of the rescue? The trickiest part of the rescue was working out how we were going to lower something down to Bean and what equipment we needed. I am especially proud of this rescue, as I thought of how to lower something down for Bean to jump into. Why did you want to become an RSPCA Inspector? I became an RSPCA officer by accident! I was unemployed and on the bus one day in Leeds, on the way to do some voluntary work. I missed my stop and got off outside the Leeds branch of the RSPCA. I heard lots of dogs barking and went to investigate. Noticing the RSPCA building, I banged on the door and the centre manager came to answer it. I was invited in for a tour and ended up volunteering for the RSPCA and working at the centre. A little bit later, one of the RSPCA staff suggested that I apply to be an Inspector – so I did and the rest is history! Could you describe what a typical day is like for an RSPCA Inspector? A lot of my time is spent on housing estates following up calls from members of the public concerned about an animal and how it is being cared for. Sometimes this means catching an abandoned animal, or helping one that isn’t being looked after properly. Occasionally I get involved in a more exciting rescue like Bean’s. Today, for instance, I helped out with the rescue of a young calf that had strayed on to a main road through a hole in the hedge. I had to help guide the calf back through the hole into the field and then help patch the hole up! What is the best thing about being an RPSCA Inspector? The best thing about being an inspector is helping an animal out of a sticky situation and seeing it healthy and happy again and in a loving home. Puppy Gets Stuck is out now! Click here to find out more and get your copy! The RSPCA helps animals in England and Wales. Registered charity no. 219099.